This eighteenth-century megillah, created in Lower Saxony, exemplifies a type of folk art found in deco- rated Esther scrolls. The distinctive orange and green palette is found in other megillot from this region. the benedictions recited before the reading of the megillah placed within a monumental gateway. the text are placed within the rest of the arcade. In addition to animals and birds, the spandrels contain scenes from the story of Esther. Included among them are Haman leading Mordecai on a horse, Ahasuerus extending his scepter to Esther, and Ahasuerus presenting his ring to Mordecai. The most distinctive image in this scroll depicts the hanging of Haman. Bound in chains, he is suspended from the gallows. A venomous snake, a symbol of evil, encircles the upright support of the gibbet. Below, a double-tailed lion holding a crowned shield gazes up at the execution. Lions were often a symbol of the Jewish people. Here it may allude to the miraculous victory of the Jews over their enemies recounted in the Purim story. This illustration of the execution appears in the center of a column of text filled with the names of Haman’s ten sons. Because they also were involved in the plot to kill the Jewish people, they, too, were put to death. According to rabbinic dictates concern- ing the writing of a megillah, the names of Haman’s sons must be inscribed to look like a “half-brick over a half-brick and a brick over a brick,” meaning that the names must be lined up in a column. This symbolizes a structure that is easily weakened and will not endure. The rabbis applied this metaphor to Haman’s sons who were vanquished and destroyed (Soferim 13:3). 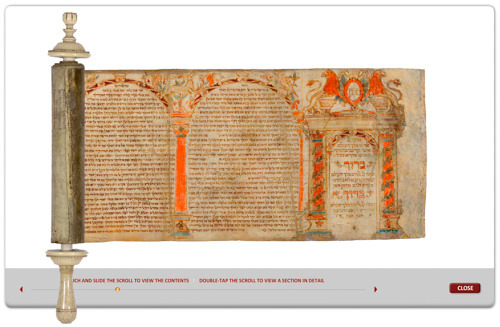 The Braginsky Collection megillah is one of three similar German scrolls containing distinctive images of Haman hanging. In the other two examples Haman is depicted smoking a long pipe while on the gallows. 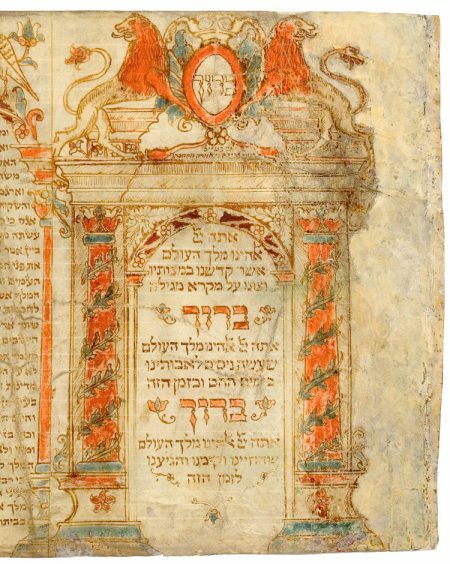 Inscriptions on the opening and closing panels of this scroll indicate that this scroll was owned by Berel the son of Abraham Neumark of Hamburg. selected literature Meekseper 1985, p. 514, no. 429.